Best known as a British design icon in the 1960s, the original Mini car broke all the traditional methods of car construction by incorporating a front wheel drive layout to create greater cabin space. The brand was eventually sold to German car maker BMW who launched the new much larger MINI in 2000. In 2011 Golden Bear won a licence to make a series of Go MINI toys under their GB Toys brand. These feature many models of this popular vehicle. 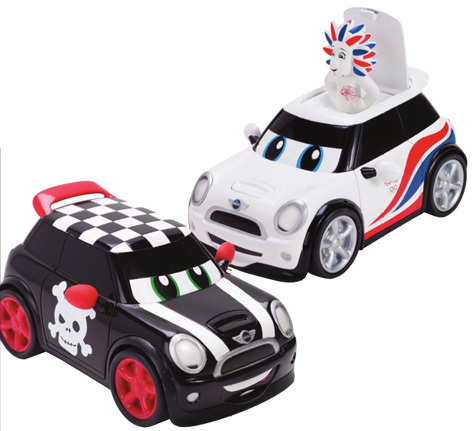 The fantastic Go MINI cars come in two different selections - Freestylers and Stunt Racers. Each of the Freestyler models has a unique feature. with fantastic graphics and realistic sounds. CHARGE makes a 'vrooming' noise whilst BEATS plays some heavy music! The amazing Stunt Racers can each perform a spectacular action - watch as BITE does wheelies, or REBEL does some awesome swerves. All of the Go MINI cars can also be launched from the fantastic Stunt Launcher. Once the speed builds up, kids hit the start button and off the cars shoot!